Join us on Wednesday, March 20, 2019 as we honour the legacy of Grandmother Josephine Mandamin and the work of her niece, Autumn Peltier. Autumn will join us at the event to accept the awards and speak. The evening also includes film screenings and a discussion. Find more information about the event online here. This is a FREE event, but seating is limited - please register in advance to ensure your spot! 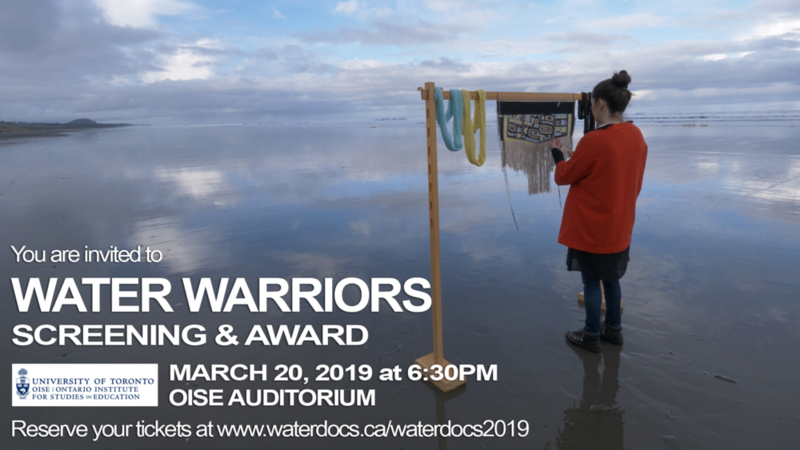 This blog was originally written for the Great Lakes Water Walk, for which Water Docs Film Festival was a founding partner. Miigwech to Grandmother Kim Wheatley for sharing her knowledge with us in this piece. Water is Life and women are life givers, and so it is a traditionally recognized responsibility for women to take care of that which is necessary for Life. Anishinaabeg teach that we as human beings were given original instructions to nurture our relationships with all Creation and to walk with our Earth Mother in a good way. We do this with respect, gratitude and love with our body, minds and spirit honouring the natural harmony on the planet. It is a necessary relationship which is reflected in our female/male roles as human beings. Women were given the role of taking care of the water and men the role of taking care of fire. This responsibility reflects the natural balance of water and fire. Too much or too little of one or the other (water or fire) and they will disappear. Anishinaabe Kwewag (Indigenous Women), and all women, have the powerful ability to carry life which is born of sacred ancestral birth waters called forth by Nokomis Giizis (Grandmother Moon) after nine months. This process has taken place since time immemorial and reflects the sacred harmony of carrying/caring for the force we call “Life”. It is therefore a woman’s responsibility to honour and care for Nibi (Water), the source of all life, for the next seven generations. Quotes from Grandmother Josephine Mandamin can be found on Indigenous Rising. All were invited to participate in the Great Lakes Water Walk this past September. To stay up to date on when the next event will take place, follow Great Lakes Water Walk on Facebook.